VITAMIN C SERUM Premium Complex With Hyaluronic Acid - IMPROVED SKIN TONE: Has powerful antioxidant effects. Serum is a key co-factor in the production of collagen, improves skin tone and texture, calms the skin. It is beneficial for all skin types. Our product includes powerful but lightweight anti-ageing serum with a high tolerance, which can be used with confidence by all skin types including sensitive. VITAMIN C SERUM Premium Complex With Hyaluronic Acid - SAFE & BENEFICIAL FORMULA: Is a safe formula, which is very beneficial for: improving your skin & giving it a youthful glow, reducing and preventing wrinkle formation, fading appearance of sun spots and discoloration, protecting your skin and preventing its premature aging, minimizing and eliminating existing wrinkles, as well as for refining skin texture. 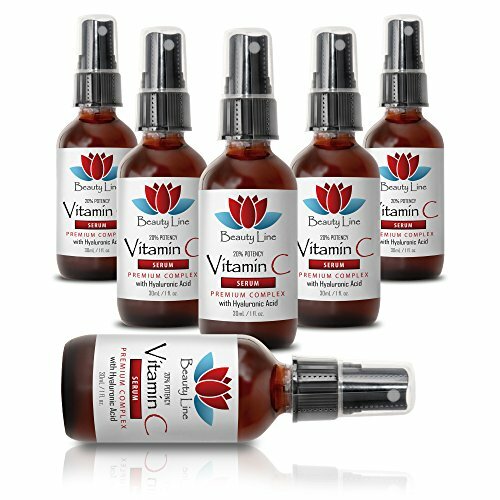 VITAMIN C SERUM Premium Complex With Hyaluronic Acid - ANTI-WRINKLE: Has very beneficial effects for your facial skin: a fresher face - plumper, better-hydrated and firmer skin - via a topical that is so absorbent and lightweight it feels as if it might never have been there in the first place. VITAMIN C SERUM Premium Complex With Hyaluronic Acid - SKIN PROTECTION: Helps to counteract wrinkle formation by increasing collagen production and protecting against skin damage like discoloration and fine lines. Our product fights free-radical damage and sun damage and improves pigmentation issues. DIRECTIONS: After cleansing, smooth a small amount over face and neck, avoiding delicate eye areas. For best results, use twice daily and follow with a moisturizer. VITAMIN C SERUM Premium Complex With Hyaluronic Acid: Serums are among the cleverest skincare innovations in recent years. The beauty of the Serum is that it offers intense skin care via the most lightweight formulation. VITAMIN C SERUM Premium Complex With Hyaluronic Acid: Vitamin C is critical for the health of human body. It also plays an important role in maintaining resilient skin. It fights premature aging and skin damage by replenishing Vitamin C levels to on skin help to combat and even reverse time effect on face. Renders your skin radiant and beautiful. VITAMIN C SERUM Premium Complex With Hyaluronic Acid: Fights premature aging and skin damage by replenishing vitamin C levels to on skin help to combat and even reverse time effect on face. VITAMIN C SERUM Premium Complex With Hyaluronic Acid: Renders your skin radiant and beautiful. Our product is very beneficial for use on facial areas. It fights premature aging and skin damage by replenishing vitamin C levels to on skin help to combat and even reverse time effect on face. PREMIUM QUALITY SUPPLEMENT MANUFACTURED IN THE USA! Best ingredients! Manufactured in state-of-the-art facilities! If you have any questions about this product by Sport Supplements, LLC, contact us by completing and submitting the form below. If you are looking for a specif part number, please include it with your message. DISC_Marcelle Hypoallergenic and Fragrance-Free Revival Pro-Sculpt Eye + Lip Contour Care - 0.5 FL. OZ. Vitamin C 20% serum + Phyto + Botanical Gel + Firming Eye Gel Advanced Formula +. Prevent / Lighten & Hydrate / Firm Eyes - 3 Combo Pack - 1 fl oz / 30 ml each.